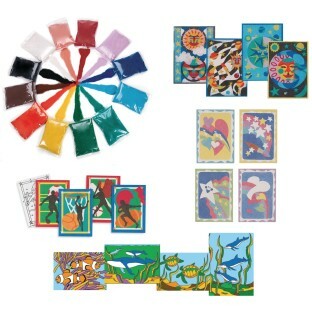 48 sand art boards per pack. Pour on the self-stick surface. Make easy, impressive art with our peel-and-pour sand art boards. No cutting, no gluing, just fun! Peel the precut shapes, expose the self-stick surface and pour. That's it! This complete Easy Pack includes 48 total 5" x 7" sand art boards in Hearts & Stars, Sealife, Sports and Celestial designs, 2-lb. bags of fine terrarium sand in 12 colors. I thought these would be boards since that is what is says in the description. Sadly they are paper thin and not good for vendor resale but fun for at home.